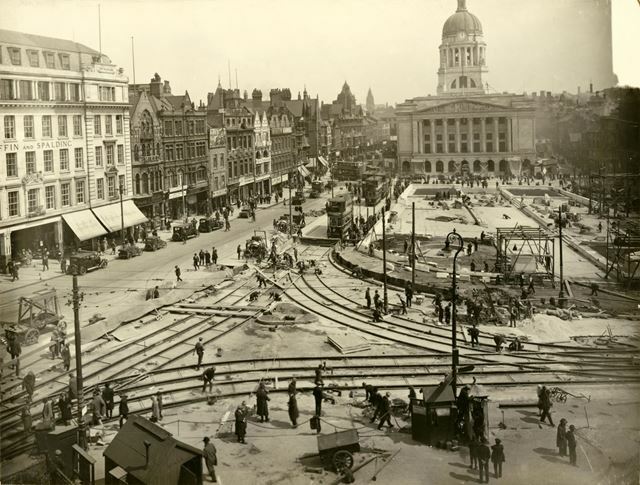 Looking East during the re-laying of the tramlines, which were moved at the time that the 'slabs' were laid out in the new Market Square. The construction of the Council House is almost complete, along with the laying out and paving of the Old Market Square and Processional Way . Long Row Central to the left, showing Griffin and Spalding (now Debenham's). The Council House stands on a site once part of Nottinghams 'great Market Place' where, from medieval times, right through the 1920`s a Saturday market was held here as well as the October 'Goose Fair' which, in the 19th. Century became a fun fair. 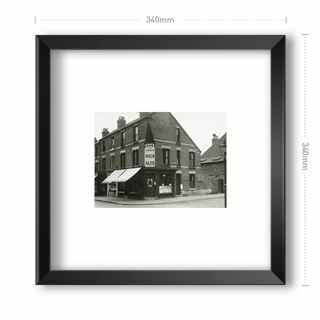 Street names like The Poultry, Cheapside and Beastmarket Hill recall the use of the area as a market. By the 17th. 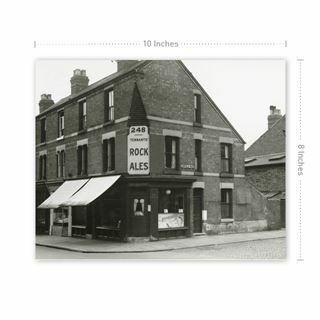 Century, a group of buildings existed at the High Street end which included butchers and other shops, plus shambles, public houses and exhibition booths. Above these a room was built, the 'Spice Chamber', in which groceries were sold and, possibly, some civic events took place; this tradition of uses became more established over the years and it is still evident today. In 1723, the Corporation ordered that a new building should be erected, in the Market Place 'with all the necessary expedition' and, on Friday, 19th. March, 1724, this matter was discussed by the Hall (Council) when, it was decided that 'a convenient number of oak trees be cut down in the 'Coppice' which the Corporation owned; later that year the building began. The 'Exchange', as the new building was named was completed in 1726 but, by 1815, it needed considerable repair and remodeling. 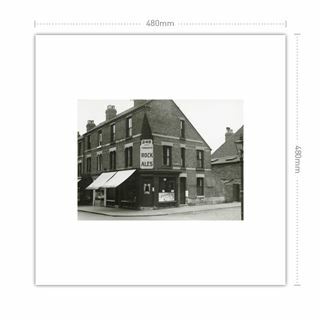 In the year 1877, the Corporation decided to move, from the old Council House in Weekday Cross, but, their needs were not satisfied and they soon had to use temporary accommodation, for Council matters. In the year of their move, the Corporation found that further repairs and alterations were necessary, on the 'Exchange' and, until the work had been done to remodel and reinstate the building, it was decided to remove the great amount of 'fine oak' paneling which had covered the walls and, for a time, this was stored at Wollaton Hall. The continuing dissatisfaction, relating to Corporation Members accommodation, continued and, in September 1920, the Estates Committee were pressed to come up with a scheme for the site the 'Exchange' stood on. The idea of a new complex was approved by the Council on 1st. December 1924 and the contract was let in May 1925. 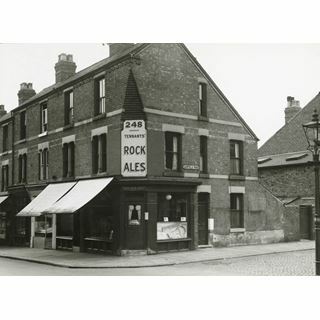 The initial estimate, for the cost of the new building work, was £429.295 plus furniture at a cost of £35,000, but the actual cost was £600,293 and thirty three pence including a processional way, a statue of Queen Victoria (now on the River Trent Embankment) and two fountains. In November, 1925, the City Council, under pressure from the Mental Hospital Committee, to increase the provision of care for mental patients, bought Aston Hall, Aston upon Trent, near Derby, to be used as a hospital for mental defective persons; the paneling, went to Aston Hall, for refurbishing that building, but did not stay there long; it was brought back to Nottingham and Cecil Howitt used it to cover the walls of the Lord Mayor`s Private Room the Members` Room and other rooms. During excavations, a considerable number of caves, ventilation shafts and cellars were uncovered; in addition, the foundation stone of the back part of the building was found, and coins were found, in holes, which had been scooped out. The only remaining pillar, of the old building, and the figure of Justice, which originally terminated the pediment at the front of the building, were taken to the castle, for safe keeping. To ensure complete safety for the new structure, some 170 large blocks of re-enforced concrete were set over 45 feet into the ground and, on these , was set a girder frame; the large blocks of concrete varied in size bearing in mind the need to have some which, ultimately, would carry 1,000 tons of weight. The stone, for the Council House, Exchange Building and the 'Market Square' (except for the paving stones which are silex stone) is Portland stone, from the Isle of Portland, off the south coast of Dorset; the quarry had been used by Christopher Wren when engaged on St. Paul`s Cathedral, London, and other churches elsewhere. One piece of stone, lying on the shore, left by Wren, was brought to Nottingham and used as the key stone of the centre arch of the front loggia of the Council House. The method adopted for dealing with the delivery of the stone was to have sufficient for two stories molded and carved and then brought to Nottingham where it was stored and, to offset difficulties, each block was numbered and later assembled like a Jigsaw puzzle; if a block was broken it was easy to replace. A steel casket, containing details of the scheme approved by the Council, a copy of the report of the Estates Committee, a copy of the minutes of the Nottingham City Council dealing with the scheme, the 'Nottingham Journal' and the 'Nottingham Guardian', along with coins of legal tender ranging from one farthing to one pound, was placed beneath the new foundation stone laid by Alderman Herbert Bowles, J.P., on 17th. May 1927 . The Council House, itself, was the largest stone building which had been built in Britain since the first world war; on its completion, it was opened by the Prince of Wales, later Duke of Windsor, on 22nd. May 1929. A Souvenir gold key, used for the opening ceremony, can be seen on a plaque which is affixed to the wall in the foyer of the Council House. The Lord Mayor was Alderman Albert R. Atkey, the Architect was T.Cecil Howitt, OBE., DSO., FRIBA., and the General Contractors were F.G.Minter, of London. As you walk along the Processional Way you can readily see the figures on the freeze, behind the portico, which were modeled by Joseph Else, A.R.B.S., Principal of the Nottingham School of Art, and represent Agriculture, Bellfounding, Cloth weaving and Mining; the terrace, overlooking the Market Square, has eight massive columns above which are twenty one figures, depicting aspects of the arts, municipal and public endeavour; Else was also responsible for the ever talked about 'lions' at the front of the building (which, according to local folklore, will roar if a virgin walks past them!). The great central dome, rising some 200 feet above ground level, is a landmark which can be seen for miles, and, around the base, you can see more of the work of Joseph Else but, this time, with three of his former pupils, we begin with Charles L.J.Doman, who modeled the group 'Civic Law', Ernest Webb who was responsible for the modeling of the group 'Knowledge', The group which James Woodford modeled was 'Prosperity'. In 1951, Woodford was commissioned to create the statue of Robin Hood, which stands under the Castle Wall. Finally, the group modeled by Joseph Else, was 'Commerce'. Whilst it is true that the four Nottingham artists played a great part in the production of the statuary the actual carving was done by Alfred W.Pond, Chiswick, London, who carved 'Commerce' and, for the others, masons employed by John Daymond & Son Ltd; London were involved. Should you happen to be within close proximity of the dome of the Council House, on the hour, you will hear the strong toll of 'Little John' the striking bell which is reputed to be the deepest toned bell in the country; it weighs two and a half tons. The mechanism of the clock is worth seeing for, like its colleague 'Big Ben', in London, the fine balance is achieved by using coins of the realm.